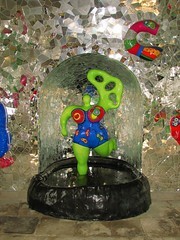 We took this photo in October 2006 while inside the Niki de Saint Phalle grotto, 3 stunning rooms made entirely of glass, in the Hannover Herrenhausen garten. I love the vivid colors forming a mosaic collage of mirrors and colors. Maybe you recognize the nana in the fountain? What do you think of it? Do you like it? Dislike? Your thoughts?